I'm braving through one tyrant of a summer cold today because I have to tell you about A PUG'S TALE by Alison Pace (released today from Berkley!) . I LOVE this book and have actually been working with Alison to get the word out to other bloggers about its release today. 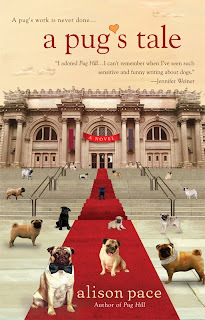 And I've gotta tell you--all the bloggers who have read A PUG'S TALE just adore it! Metropolitan Museum of Art paintings restorer Hope McNeill feels like she finally has it all. Aside from the dream job, she has an amazing boyfriend who has left his adorable black pug Max in her care while he's overseas on a humanitarian mission. That she’s able to sneak Max into work with her is just the icing on the cake--that is, until an art heist on her watch brings everything tumbling down. Also, A PUG'S TALE is actually a standalone to another great book, PUG HILL , and I was so happy to be "reunited" with Hope again. I really fell in love with the character and her lovable, so-New-York neurose in the first novel, and I was just so glad to see her get what she wanted in life (but I won't tell you anymore or that would be spoiling the fun!) And, Alison's writing is just so much fun and so witty that, with both books, I found myself laughing out loud or marking down passages to share with friends. Now that's the hallmark of a good book--the want to share it with others! Ok, enough of my blathering. Check out the first chapter of the book for yourself HERE, visit Alison's website for more info, and then enter below to win your very own copy of A PUG'S TALE courtesy of Berkley. All you have to do is follow Rockland Mother and comment below before 11:59pm on June 12, 2011. Disclosure: I work with Alison Pace and was provided a copy of A PUG'S TALE to give away by Berkley. The opinions above are my honest opinions and were in no way paid for. After reading your overview I can't wait to read this book! I'm an on-again member of the Met (depending on how flush my checkbook is...), and I love a book that will make me laugh out loud on the NYC subway. That way I fit in with the many "odds" & ends on the trains. I also want to get this book so that I can send it to my Aunt Nanci, who loves pugs, and has one of her own named Fritz. If I could upload a picture, I would post Fritz's pug-mug here! Tell me Lisa, how do I enter to win your coveted copy?!?! I love finding new authors, I'll have to check this out. I am a follower! Darn! I missed the cut off! Eh, well. This book looks cute. :) Just checking in here!